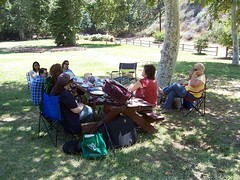 We had a very nice meeting today in the beautiful outdoor setting of Franklin Canyon. While some folks did get a bit lost, we all made it eventually and had some great discussions. There was plenty of shade and a cooling breeze, too. Come join in the fun at our next meeting – August 20 @ Hollywood and Highland.